Material : NBR, EPDM, Nitrile, Silicone, Viton etc. Abiding by quality focused approaches, we are engaged in manufacturing and supplying premium quality Rubber Bush. To meet the varied requirements of patrons, we provide the offered wiper seals with metal as well as without metal, different sizes. Moreover, we provide the offered wiper seals as per the details specified by patrons to ensure their maximum satisfaction. Brand Our own manufactured products. The exceptional bearing and wear properties of Nylon make it one of the most widely used plastics in the world. Nylon is frequently used as a replacement for bronze, brass, aluminum, steel, and other metals, as well as other plastics, wood, and rubber. Nylon (Polyamide) is the generic name for all long-chain fiber-forming polyamides with recurring amide groups. Polyamides (Nylon) comprise the largest family of engineering plastics with a very wide range of applications. The family of nylons consists of several different types. Nylon 6/6, nylon 6, nylon 6/10, nylon 6/12, nylon 11, nylon 12, and nylon 6-6/6 copolymer are the most common of these, nylon 6/6 and nylon 6 dominate the market. Nylons offer extremely good wear resistance, coupled with high tensile strength and modulus of elasticity. They also have high impact resistance, a high heat distortion temperature, and resist wear, abrasion, and vibration. In addition, nylons can withstand sustained contact with a wide variety of chemicals, alkalis, dilute acids or oxidizing agents. Another important factor both economically and mechanically is the relatively light weight of nylon. Nylon is approximately 1/8 the weight of bronze, 1/7 the weight of cast iron, and 1/2 the weight of aluminum. This reduces both the inertial and static loads and eases the handling of large components during maintenance or replacement procedures. Even in the harshest environments, subjected to temperature extremes and harsh chemicals, Viton fluoroelastomers perform extremely well. With that in mind, this rugged rubber is ideally suited for applications requiring hard-wearing Bush. Viton might just be the most durable and high-performance rubber material that you’ve never heard of. Here, 360 Industrial Products Co. gives the full lowdown on this impressively versatile fluoroelastomer. Viton® is a synthetic rubber and fluoropolymer elastomer, commonly used in Bush and other molded or extruded products. This family of elastomers comprises copolymers of terpolymers of tetrafluoroethylene (TFE), hexafluoropropylene (HFP) and vinylidene fluoride (VDF or VF2), vinylidene fluoride (VDF) and hexafluoropropylene (HFP) as well as perfluoromethylvinylether (PMVE) containing specialty polymers. Viton has become the most commonly associated name with this fluoropolymer family. There are four families of Viton polymers, and the fluorine content of these most popular Viton grades varies between 66 and 70%. The main grades are A (Dipolymers of VF2/HFP), which has a fluorine content of 66%; B (Terpolymers of VF2/HFP/TFE), which commonly used for seals or bush and contains 68% fluorine; F (Terpolymers of VF2/HFP/TFE), which is used in oxygenated automotive fuels and has 70% fluorine content; and finally specialty types (such as GLT, GBLT, GFLT & Viton Extreme), which are used in automotive and oil exploration applications. Compared to most other elastomers, Viton is better able to withstand high temperature, while simultaneously retaining its good mechanical properties. Oil and chemical resistance are also essentially unaffected by elevated temperatures. Compounds of Viton remain substantially elastic when exposed to laboratory air oven aging up to 204°C or to intermittent exposures up to 316°C. Viton grades also resist degradation from a wider variety of chemicals and fluids – including oils, fuels, lubricants, and most mineral acids – than any other non-fluorinated elastomer. In layman’s terms, that means it provides the best fluid resistance of any commercial rubber. With its low permeability to such a broad range of substances, Viton is known to deliver exceptionally good performance in oxygenated automotive fuels. The rugged characteristics Viton don’t stop there, however. Because they also display good resistance to compression, even at temperatures that would make other non-fluorinated elastomers brittle. It is also especially resistant to atmospheric oxidation, sun, climatic conditions, fungus, and mold. Furthermore, Viton has good electrical properties (in low voltage, low-frequency applications) and low burning characteristics. A rubber bushing, sometimes simply called a bushing, is a kind of vibration isolator. Its main purpose is to serve as an interface between two parts, acting as a buffer and absorbing some of the energy produced by the interaction of two parts. It separates two parts while allowing a limited amount of movement, thus minimizing vibration and even noise. 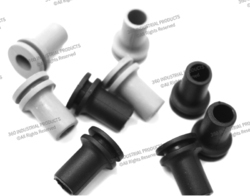 Rubber bushings come in a variety of forms. Typically, they are fashioned into an annular cylinder shape and are encased in metal cases or in outer tubes. In other applications, the bushings have an internal crush tube which protects them from being crushed. The use of rubber bushings is often preferable to solid connections as noise and vibration are lessened. They can also eliminate the use of lubrication between two parts. 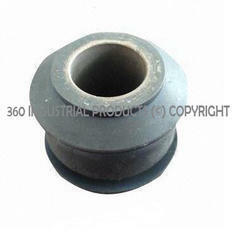 Rubber bushings are widely used in the production of machines. Typically, they are found in anti-roll bars, shock absorber mountings, double wishbone suspensions, gear sticks and in the internal combustion engines. Eventually, rubber bushings were used in parts that generated vibration and noise. 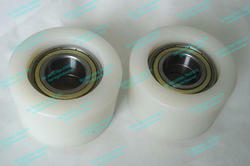 They are also used in skateboards where they aid in the tilting of the trucks and turning the board. 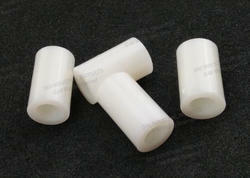 Rubber bushings may also be used to help transfer load from one area in a structure to another, thus reducing strain. 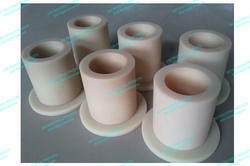 These bushings can also be used as shock absorbers, vibration insulators and abrasion resistors. 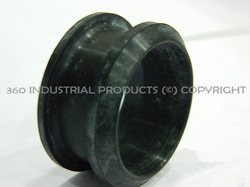 Used with wires, pipes and tubings, rubber bushings can act as seals. 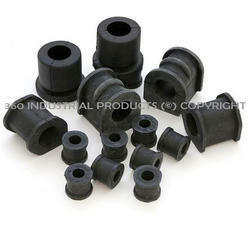 Rubber grommets are similar to bushings and are also used in a variety of functions. One of the most common functions of grommets is to protect eyelets from wear and tear as parts or objects pass through these. They may also be used in wires, rods and pipes that go through firewalls and plates, acting as seals. 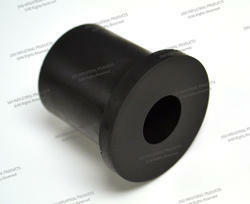 Disadvantages: Rubber bushings do have a few disadvantages that are well worth considering before using them. One of these disadvantages is that they can wear out easily, especially when used in an environment where oils are used. They are also susceptible to extreme temperatures. Nitrile rubber (NBR), also called nitrile-butadiene rubber, an oil-resistant synthetic rubber produced from a copolymer of acrylonitrile and butadiene. Its main applications are in rubber bush, gaskets, rollers, and other products in which oil resistance is required. Nitrile rubber is mostly used where high oil resistance is required, as in rubber bush, gaskets, or other items subject to contact with hot oils. The rolls for spreading ink in printing and hoses for oil products are other obvious uses. NBR is also employed in textiles, where its application to woven and nonwoven fabrics improves the finish and waterproofing properties. NBR is made in a hydrogenated version (abbreviated HNBR) that is highly resistant to thermal and oxidative deterioration and remains flexible at lower temperatures.